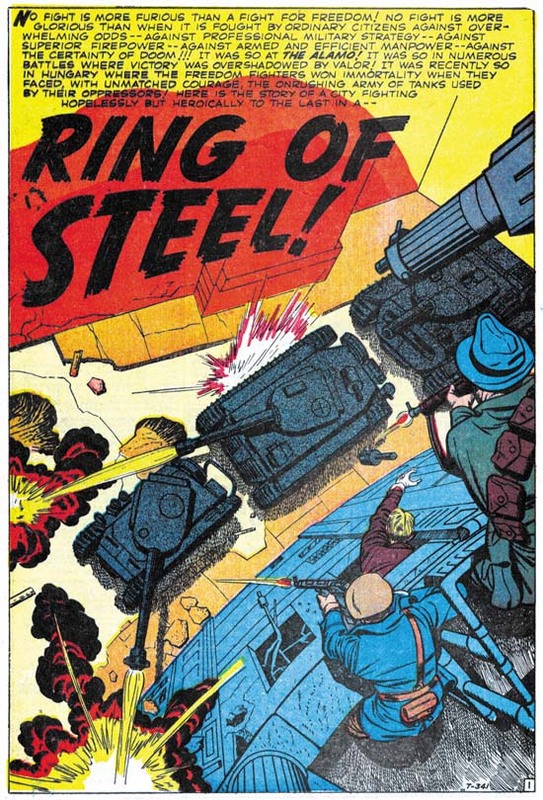 I love the perspective as well on the splash page of Ring of Steel. I still feel that Kirby had a hand in the writing of these stories, even if they were edited by Stan Lee, which is quite likely. 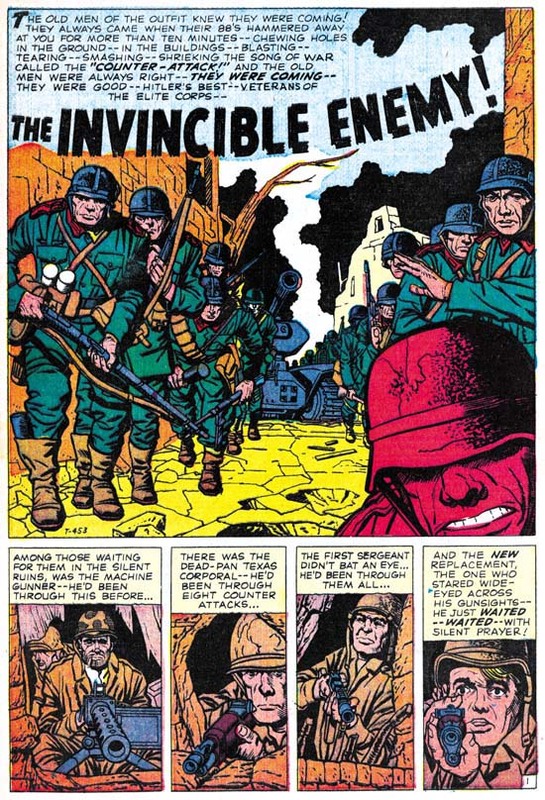 The inker for these 2 stories is Christopher Rule, and I agree he did a fine job over Kirby. 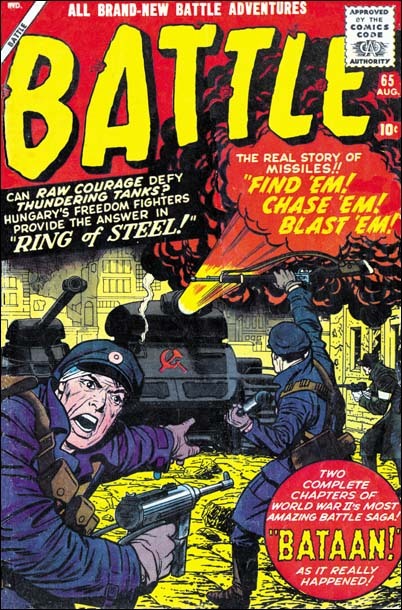 Although I will not make the claim for all Battle stories that Kirby drew, in the case of “Ring of Steel” I really think the writing was not Jack’s. Not at all like his use of words. And I do not think I have ever read anything by Jack where he used the type of repitition as occurs on page 4. I leave open questions of possible involvement in plotting. Thanks for your observation about the inking being by Christopher Rule. In an unpublished article I did for TJKC about two years ago, I wrote about Jack’s 1955/6 work at Timely. The article was called When Jacob Met Stanley. I am glad to see you are covering this period as well. Have you had a look at the two earliest ‘sf’ stories he did yet? Form the job numbers I get the impression they could have been brought in by Jack as left over stuff from the temporary stop in publication of the Harvey horror books. It wouldn’t even surprise me if there is some Joe Simon inking in them, but you are a better judge of that than I am. This is the explenation of the job numbers. It is most likely that job numbers wre given out to written stories rather than drawn ones. They were added to a script when it was brought in by the writer (at which point they were also entered for payment, so that makes sense. We know this because some treatments have turned up without a job number and Doc files’ of one of those writers confirms this. If you look at the first three job numbers Jack Kirby did, this could mean he brought in the stories already done. Stan bought them and added kob numbers. He also gave Jack a new (war) story to draw, which had a job number earlier than the stories Jack brought in, because it was picked from the pile of scripts. I’d love to hear your take on this. If you haven’t got scans of those stories I can provide them. Contact me privately. Unfortunately I have not seen all the pre-Implosion Kirby stuff. But I have seen and posted on Astonishing #56 (//kirbymuseum.org/blogs/simonandkirby/archives/705). My conclusion was that it was written, drawn and inked by Jack although it was not his best inking. I will be returning to the inking question in a serial post on Kirby’s “late” inking style that I will be starting in a week or so. Originally I surmised that in all his pre-Implosion work Kirby had similar control over his material. But Jack’s Black Rider work convinces me otherwise. As for your theory that Jack brought the work in finished that is certainly a possibility (at least for Ast. #56). But I will say that Harvey was publishing Kirby material at this time so I see no reason why it should be left over from that publisher. In the Strange Tales Of The Unusual story I detect a few Simon touches, so I’ll try and get it out, scan it and let you take a look at it. As I showed above, if Astonishing was brought in, the job numbers show that Unusual was brought in with it. I mentioned Harvey because I thought the Harvey ‘horror’ books were suspended for a year around that time. We are talking about a publishing date of late 1956. Black Cat was suspended for a year between #58 and #59. At the time it may have seemd the book was cancelled and Jack could have taken the two stories to Stan. The timing seems to fit. The Strange Tales and Astonishing Kirby stories were cover dated for December 1956. Harvey published Black Cat Mystery #57 in January 1956 while Black Cat Mystic #58 was September 1956. So your theory could be correct as far as that is concerned.